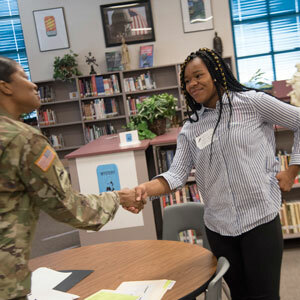 A pretend interview had some real-life applications for the eighth-grade students at Audie Murphy Middle School. 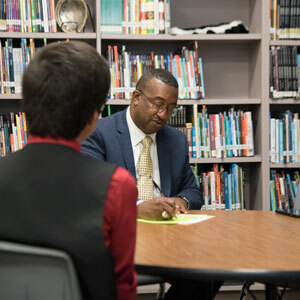 Once a semester, Communities in Schools hosts mock interviews for all eighth-graders to help them prepare for what a real interview would look like. Students do their research on a specific job they are looking for and then prepare their resume and cover letter for that position. Interviews are 15 minutes long and interviewers, who are C.I.S. 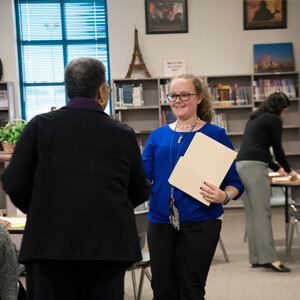 volunteers, offer feedback during and after the interview. “They have been so knowledgeable you can tell that they have done their research about the job,” stated Britany Watson, a CIS volunteer and interviewer. Dressed in their best attire, students are asked various questions about their personalities, strengths, salary requirements and why they’d be a good candidate for the job. Eighth-grader Samantha Ristine “applied” for a position as a hostess at Chili’s and thought she made good eye contact with her interviewer. After the interviews are completed students go back to their classrooms and the following day write a thank you letter to their interviewer. “They get to learn about and go through the entire process of applying for a job,” said CIS teacher Amorin Nunez. Ristine was thankful for the opportunity and had a few pointers for her peers.